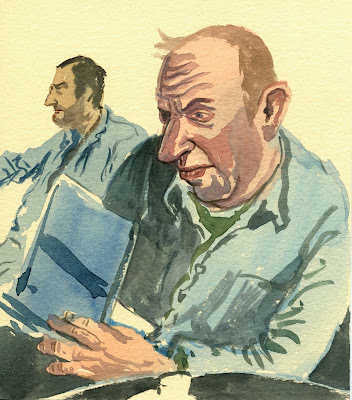 In a London cafe, a sketcher is sketched. Watercolour on yellow paper. 14cm x 17cm. Click to enlarge. wow great, wonderful aquarell! i´m impressed. Judging from the twisted body and facial expression he's desperately trying to get the perspective right. 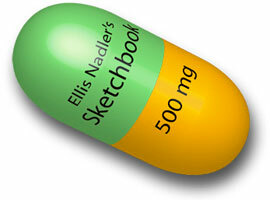 But who will sketch the sketcher who sketches the sketcher? Very nice! I love sketching in watercolor. I well know that expression! Qui sketchodiet ipsos sketchodes? Ellis Nadleris, that's qui.